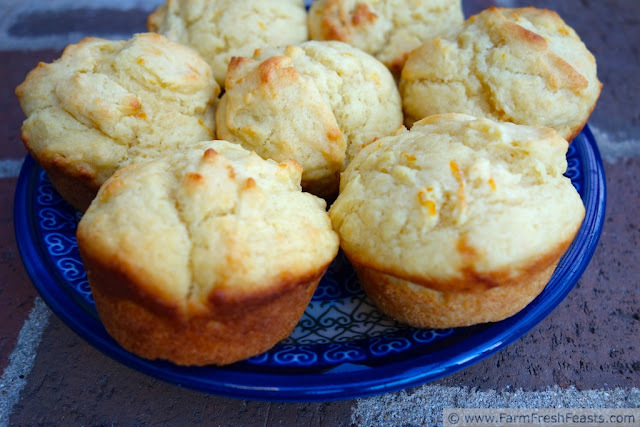 When I saw these muffins I knew I wanted to try making them using one of the citrus fruits from the Band Fruit Fundraiser stash. I also had ricotta that I wanted to use up so I could try and make my own like Annemarie does. However, I made one of the classic blunders (no, not the "never get involved in a land war in Asia one" nor the "never go against a Sicilian when death is on the line" one): I didn't read the entire recipe first. So at 6:20 am, when I stumbled into the kitchen with the intent of making Tangerine Ricotta Muffins for my kids' breakfast, I was caught unawares with "1 stick of butter, softened" as an ingredient. Oops! I hadn't set out any butter to soften and I didn't really want to nuke one because good grief an entire stick of butter in a pan of muffins? My kids eat 2 or 3 muffins a piece! I didn't want them to consume 1/4 stick of butter just with breakfast--and that was before I read "1 cup of sugar". If you've seen my other muffin recipes (muffin recipe index to your right), you know that I serve them to my kids as part of breakfast or after school snacks--not dessert--so my muffins are usually whole grain and contain less sugar and fat than what I see in many bakery muffins. I set that recipe aside for a future dessert, because it looks so delicious and I think my family will love it for a special treat. Instead, I took my ricotta cheese, my tangerines, and my muffin-making skills and made these muffins. The kids loved them hot with a bit of buttery spread. I liked mine later, room temperature, with my tea. The next day my son grabbed some to take on the road to his sled hockey tournament and my daughter spread hers with strawberry jam. Next time, I'm thinking white whole wheat flour, honey, and tangelos . . .
For other recipes using tangerines, please see my Tangerine/Tangelo Recipes Collection, part of the Visual Recipe Index by Ingredient. 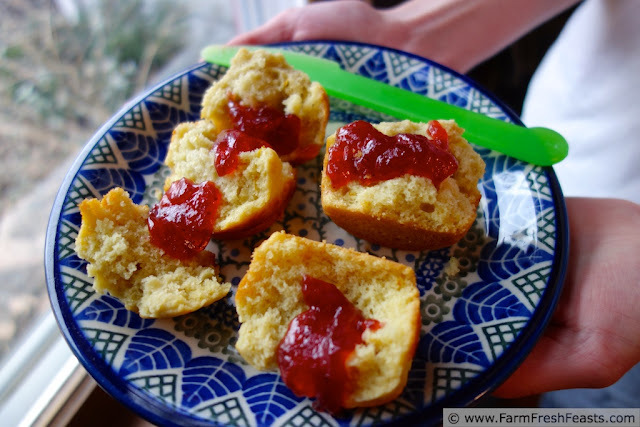 For more muffin recipes, look to the Recipe Index by Category on the right sidebar -----> under Muffins. Wanna know how to Use This Blog? Click here. Spray a regular 12 hole muffin pan with oil. In a large bowl, mix wet ingredients (sugar goes here too). If you don't have to squeeze your tangerines section by section because you have a better way, share it with me (please!) in the comments or on my FB page. Oy, that took forever! The composting pigs got the squozen sections. I know that's not a word. Dump the dry ingredients on top. Stir until just combined. Scoop** into a prepared muffin pan and bake for 16 minutes. Cool 3 minutes in the pan, then flip onto a rack and let the kids at 'em. Serve. That first shot is beautiful. They look so light and fluffy, and the tangelo zest just sings to me. Juicing citrus is a labor of love, unless you've got a citrus juicer. I've been using my Citrus Zinger water bottle as a faux juicer and that helps a ton. Now I need ricotta cheese. Damn you and your delicious muffins. After getting a case of juice oranges I walked down to the grocery store and bought myself one of those little 'top of glass' juicer things. Next time I make these I'll be set! I'm thinking of savory with cottage cheese and roasted squash, be forewarned. These look delicious! I love baking with ricotta (though I haven't yet made my own either. Someday...). I picked up a cheese making kit on a Groupon or Troop Swap deal--so I even have the technology! I'm not sure what's stopping me--perhaps I need to score a deal on milk. These sound very yummy! 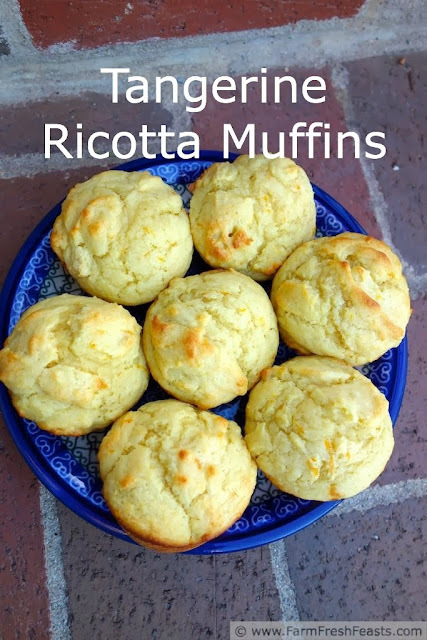 I've made ricotta cookies before, but never tried them it in muffins. I love the citrus/ricotta combination. I have made ricotta before, and it's crazy the amount of milk it takes to make one little batch of cheese! Remember to save the whey and use it for pancakes! Have fun! Oh, the whey! I think I'll have to do a 'use up whey' recipe round up sometime. Ricotta cookies sounds pretty good to me. I would be snacking on these all day long! Thanks for linking up with What's Cookin' Wednesday! I'm glad my kids take them off my hands--keeps my hands off of the muffins!